The Xiao Long Bao Experiment - mmm-yoso!!! Believe it or not, it's from our kitchen. A few weeks ago, I planted a little seed in the Missus's mind. One of the sites that I visit quite often is eatingchinese.org, and Gary Soup does an excellent job of finding interesting links and articles on Chinese food. 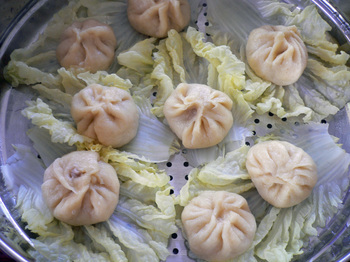 On the site is a link to a Xiao Long Bao Tutorial. I mentioned this to the Missus, who immediately said "uh-uh, no way, don't know nothin' about making Xiao Long Bao." But understanding that "dough" and "dumplings" are so basically entrenched in the Missus's fate, a few weeks later she asked me to print out the Xiao Long Bao recipe....and we were on our way. So what follows is a very "broad" interpretation of that recipe. There are other recipes out there, but we decided to use the Chinese recipe as a guide. Again, it was just a guide. I'll be documenting what we did, and what the results were. It was quite "interesting". 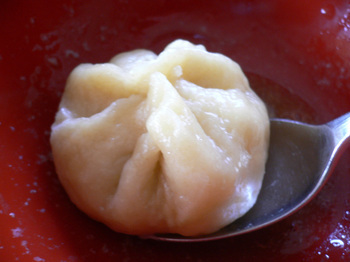 There are many variations on the "soup" for soup dumplings. 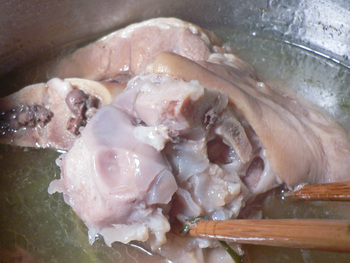 Some use chicken feet, pork "skin", or other items. We chose Pig's feet. There was also an item in the recipe to "congeal" the soup. 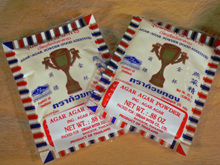 The Missus didn't quite know what it was, but later with some help, we determined it was Agar-agar. So on Friday we made "aspic". 1 - Set a pot of water to boil. 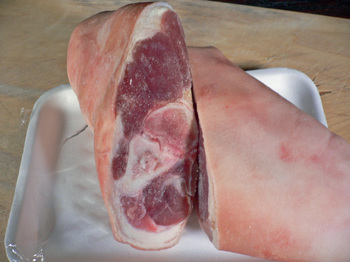 2 - Once boiling, place pig's feet quickly in the water for 10-15 seconds to allow removal of "scum" on pigs feet. 3 - Rinse and scrub well. 4 - Place in pressure cooker and cover with water. In this case 8 cups. 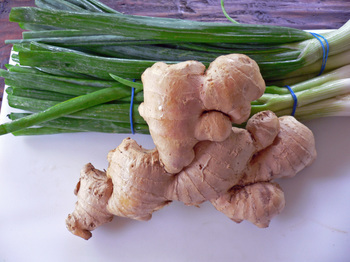 5 - Add greens onions, ginger, Shaoxing, and white pepper to liquid. 6 - Close pressure cooker and bring to "high heat", once high heat is attained, lower temp to maintain high pressure for 45 minutes. (Approx a two hour simmer on a conventional stove) After 45 minutes let the pressure drop normally for 15 minutes, then quick-release pressure. The meat should just fall away from the bone. 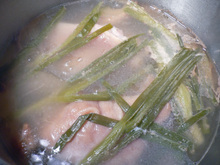 7 - Remove all large remaining portions of pork then strain. 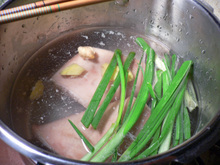 8 - Place broth into a large pot or "wok" and defat. 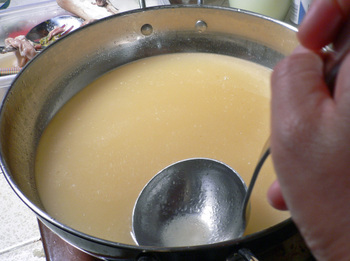 Bring broth to a simmer and add agar-agar. To add agar-agar first get a ladle of broth and add agar powder and start mixing. Slowly lower agar into broth and gently mix until fully incorporated(no "glops" or lumps). 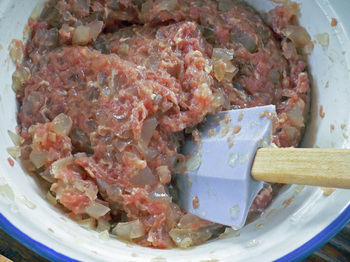 9 - Remove from heat. 10 - Cool, then cover and refrigerate. So now you've woken and are totally "psyched" about making some Xiao Long Bao! 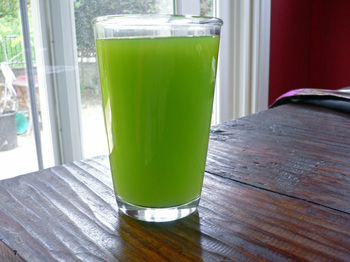 So while the Missus was making the "dough", I made the Ginger-Scallion Water from the recipe. 1 - Placed ingredients in blender. 2 - Pulse until all ingredients are "chopped"
3 - Strain and place water aside. The dough? Well, I'm sorry, but the Missus does it all by "feel". What she can tell me is that according to the instructions, she used a combination of high-gluten flour and all-purpose flour, along with cold water. She then kneaded until it formed a "dough" and no longer stuck to your hand. 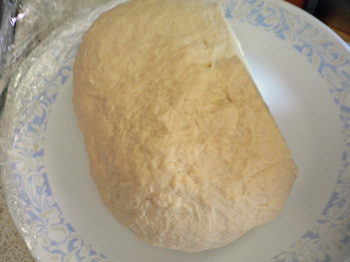 Then allow the dough to rest for 20 minutes. 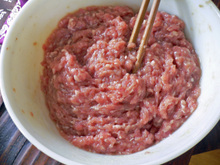 1 - Combine Ground Pork, Pepper, Salt and Sugar (twice the amount of sugar then salt), and Soy Sauce. 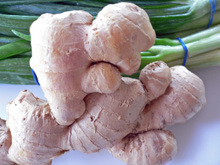 2 - Stir Pork mixture in one direction while adding Ginger Scallion water until the filling is saturated and achieves a "pasty" texture. 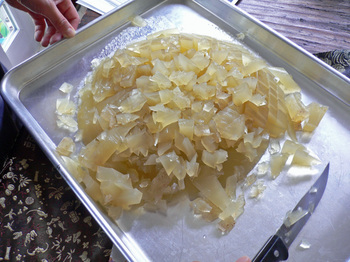 3 - Remove the aspic from the refrigerator and "unmold". Slice the jell into small cubes. 4 - Make sure the cubes are small - we also added egg yolk to bind. 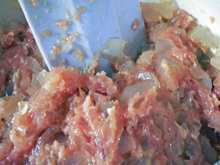 4 - Mix equal amounts of aspic and pork filling together. I then left it to the Missus to roll out the dough and form the dumplings. And boy did I feel for Her. You see, in order to form the dumplings, the dough had to be "stiff", to the point it was really difficult for Her to roll out. When we had enough, I started steaming them. I thought they looked great, and they also stood up to the heat well. I still managed to eat 2 dozen. The filling was tasty. And we had alot of fun making this. I am so very impressed!!! They look wonderful! There is nothing like homemade to make food taste good mmmm I want some now! BTW I think your missus did a fab job! 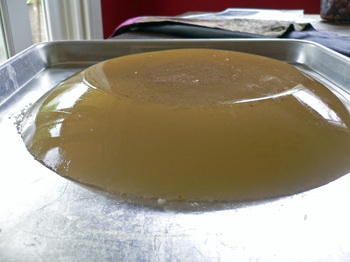 If you get enough gelatine into the aspic I don't think you would need any agar, but it will definately make sure that it sets! Hi Clare - Based on the recipe in Chinese we weren't really sure - but I think the trotters just need a bit of "help". And yes, the Missus did a gradn job! LOL I think we did that simultneous commenting thing. the advantage is that the agar part doesn't need to be as cold as the gelatin part to set. Perhaps they are worried that all gelatin will melt in China when it is hot? or in a hot kitchen??? WHOA!! Super-cool that you actually made shao loeng baos, and they look great! There are several things that my Mom told me that you should never make at home, just because of the sheer amount of labor and effort involved. Shao loeng baos are one of those items my Mom warned me against. You and the Missus really expended a lot of effort on those little meat pockets. I'm glad that the results were worthy, and that you learned how to improve in the future. Hey, my motto is, try and try again, and eat the failures! Plus, the dumplings were tasty enough that you wolfed down dozens of em', and therefore, they were a success in my book! Remind me to send you my recipe for Hot and Sour Soup. Hi kirk, Congrats to you and the your wife for doing a great job. Looks ono. Regarding the dough...I use a food processor and it whips up in mins. I then roll it out with a pasta roller,so fast and easy. My recipe is 2cups of bread flour, 2 eggs ,1tsp. 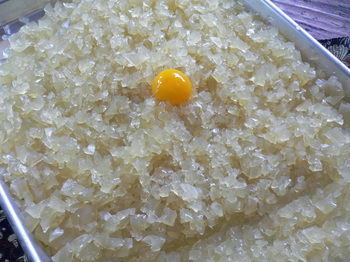 salt and water (aprox 1/2cup) more or less dep on text.I like the smooth texture you get from the eggs. You cant beat using a pasta roller! the sheets can be as thin as paper and transparent. Bravo Kirk and the Missus! These look great. The closest I come to making xiao long bao at home is steaming the frozen ones from 99 Ranch. I feel for your wife though - there's a tourist restaurant in Shanghai where you can watch hundreds of bao being made and it looks so tiring! I especially feel for the people that have to "de-crab" the tiny hairy crabs just to use their roe in the dumplings. I am saving this, and maybe try it some time in the future! I feel for your Missus, but tell her she did a gorgeous job. I think i need to come over and learn how to fold them, so nicely. I can do mandu, but the round dumplings seem harder for me. I bet they tasted really delicious, and a lot better than most restaurants. I was surprised there was too much soup. I need to get away I am hungry! Wow, this looked like quite an undertaking! And the results look beautiful. Next time I'm sure you'll be able to get it perfect. The too much soup comment made me think of the first time I saw my cousin eat xiao long bao. I always try to eat it in one big bite so that none of the soup spills out. After all, it's what makes it so unique. My cousin would bite a hole in the side of the dumpling and discard the soup onto his plate. I felt as thought I had been punched in the gut! Hi Clare - We did like how the aspic "set", so I think we'll just lower the amount of Agar, next time. Hi PE - Always so positive! The skins were too thick for the Missus, so we'll have to come up with something to solve that. There were quite a few steps involved in making this. Hi Kathy - Unfortunately, the dough was not up to the Missus's standards. Hi Jean - Consider yourself reminded! Hi shar - So you've made Xiao Long Bao? They are very different from Jiaozi - the dough has to be much stiffer. 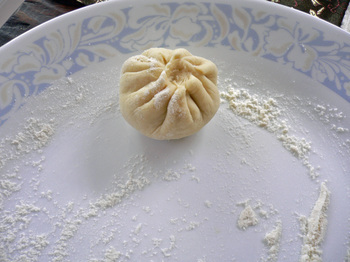 Also, for Jiaozi, the middle of the dough for each dumpling has to be thicker then the edges which are folded - this is why most good Chinese Dumpling Houses still roll out their dough by hand. Almost sounds like you're making pasta dough. Hi Candice - Hope the new "gig" is going well. I really felt bad for Her, the dough was very stiff. Hi Mills - Thanks much! Hi Howie - Oh my, that's heresy, letting the "soup" from the soup dumplings escape! Holy xiao long bao Batman! I didn't even realize that's how the soup gets in there...agar-agar cubes! I've always thought, naively I might add, that someone went around and stuck a syringe full of broth into each dumpling before steaming! Hi Elmo - Well great minds think alike....I think. I thought the same as you until I read the pictorial a few months ago! It was one of those; ooohhh, that's how they do it moments! But I've noticed that you don't have a recipe category...please make one. This is absolutely the kind of impossible exotic thing I am always wanting to try when I have some time on the weekends. No matter how it turns out it's always an adventure...the shopping, the preparing, the waiting, the cooking, the tasting, the photography, and then the eating and the posting. Lots of work and lots of fun. Hi Emily - Ok, it's done - took I bit longer then I thought, but there is now a recipe category. Those are beautiful, Kirk! You and the Missus really took on a project, and while they are not perfect (I know how dissapointing it can be to have dough come out rolled too thick--my first jaozi were like that) they are still lovely. Hi lance - Oh geez, it wasn't that big a deal! Thanks though!